Jen & Justin get their party on with Clooney! Jennifer Aniston and Justin Theroux are ringing in the New Year south of the border! Over the weekend, the A-list couple attended a special event in Mexico with pal George Clooney for his alcohol brand Casamigos Tequila. The annual brunch was held at the El Dorado Beach Club in Los Cabos, Mexico, yesterday. In addition to Clooney, Aniston and Theroux, Jimmy Kimmel, Howard Stern, and Casamigos partners Mike Meldman and Rande Gerber and Gerber’s wife, Cindy Crawford, were all in attendance, as was Michael Phelps, who shared an Instagram pic of a tequila aging barrel. And the week before, Aniston and Theroux partied with Clooney at a different pre-New Year’s bash! All the same celeb guests were in attendance, including Aniston and Theroux. Aniston and Theroux arrived in Cabo San Lucas just after Christmas for a romantic getaway together. Watch out, Taylor Swift ! Singer-songwriter Ed Sheeran, who is besties with Swift, celebrated Thanksgiving with another A-lister: Jennifer Aniston! Aniston’s manager Aleen Keshishian shared a photo of the star with the British singer on Instagram, writing, “#HappyThanksgiving.” In the pic, the We’re The Millers actress shows off her newly chopped locks and looks super cozy with the “Give Me Love” crooner. 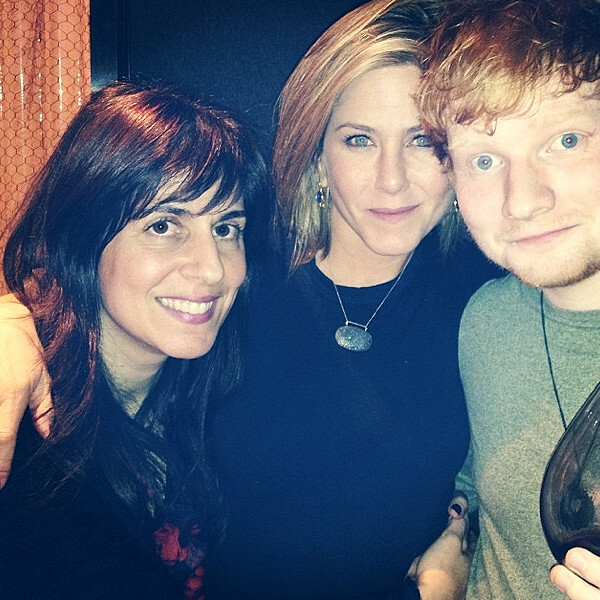 So how do Aniston and Sheeran know each other? While it may be a surprise to some that Sheeran and Aniston are friends (especially ones that spend a holiday together! ), the duo actually have a mutual friend in common: Aniston’s BFF and former Friends costar Courteney Cox! Sheeran recently posted a photo of himself with Cox on Instagram, revealing that he actually lives in the Cougar Town star’s beach house! Talk about a rock worth waiting for. It’s been almost two months since Jennifer Aniston and Justin Theroux announced their engagement, and the stunning sparkler that we’ve all been dying to see has finally been revealed. Oh, and did we mention the ring is huge? The 43-year-old star was snapped on Saturday in Santa Fe, N.M., sharing a sweet moment with her hubby-to-be, and the couple looked oh-so-in-love as Jen gave onlookers a glimpse of her massive rock. This is the first official look we’ve had of the lust-worthy ring—Jen was caught sporting the bauble on the set of her new movie We’re the Miller, but the sneaky star had the ring turned upside down in order to hide the giant diamond. Jealously aside (seriously, that thing is enormous! ), there’s no doubt Jen deserves both the wedding and the ring of her dreams. Congratulations to the wonderful couple! We can’t wait for Jen to rock the red carpet showing off that rock. 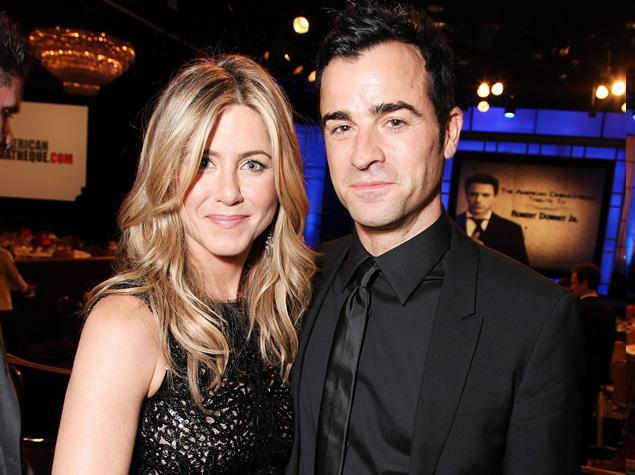 Jennifer Aniston and Justin Theroux at American Cinematheque’s 2011 Award Show in October. Jennifer Aniston and her beau, Justin Theroux, are more than just friends — they’re engaged. Seven years after her marriage to Brad Pitt ended in divorce, Aniston announced Sunday she’s ready take another plunge into matrimony with Theroux. Theroux proposed to the former “Friends” actress on his 41st birthday. “Justin Theroux had an amazing birthday on Friday, receiving an extraordinary gift when his girlfriend, Jennifer Aniston, accepted his proposal of marriage,” Theroux’s representative told People magazine. The couple didn’t announce a date for their nuptials. Aniston, 43, and Theroux — who co-starred this year in the comedy “Wanderlust” — began dating in May 2011. They were soon spotted out in public together, wearing matching leather jackets while strolling around the streets of New York City, even sharing rides on Theroux’s motorcycle. The couple recently bought a $21 million California mansion to call home. They had been shacking up for the past few months in a $40,000-a-month Beverly Hills home. This will be the first marriage for Theroux, who was born and raised in Washington, D.C.
Before dating Aniston, Theroux — also known for writing screenplays, including “Iron Man 2” — was in a longtime relationship with costume designer Heidi Bivens. The engagement comes as no surprise to friends of the couple. Aniston has even made it clear that she’s smitten by Theroux. Theroux and Aniston first met about five years ago when he worked on the set of “Tropic Thunder” — a film Theroux co-wrote with Ben Stiller. The big announcement came just five months after Pitt and Angelina Jolie got engaged. Pitt and Jolie threw a spectacular shindig at Chateau Miraval, their ultraprivate estate, in the south of France, last week. Speculation that that party was a front for their wedding turned out to be false.